With its unconventional yet highly effective approach, How Does Earth Work? demonstrates the process of science as a vehicle for investigating physical geology. Smith and Pun connect readers to the evidence behind the facts, instead of reproducing known facts—sparking interest in how science is practiced and how we know what we know. Like geology detectives, readers learn to think through the scientific process and uncover evidence that explains Earth’s mysteries. 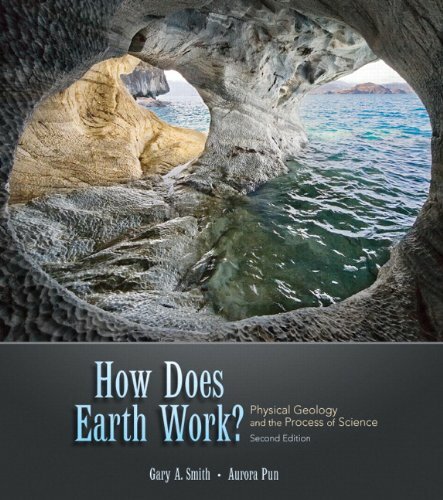 Chapters open with an essay that places a curious investigator in a realistic field or lab setting to observe and ask questions about geological phenomena. Integrated real-world connections link topics to issues of societal concern or relevant experience to increase appreciation of the value of discovering science. and annotated illustrations with thoughtful descriptions help readers observe the hypotheses presented. Why Study Earth? Minerals: Building Blocks of the Planet. Rocks and Rock-Forming Processes. Formation of Magma and Igneous Rocks. Formation of Sediment and Sedimentary Rocks. Formation of Metamorphic Rocks. Earth Materials as Time Keepers. Journey to the Center of Earth. Making Earth. Motion Inside Earth. Deformation of Rocks. Global Tectonics: Plates and Plumes. Tectonics and Surface Relief. Soil Formation and Landscape Stability. Mass Movements: Landscapes in Motion. Streams: Flowing Water Shapes the Landscape. Water Flowing Underground. Glaciers: Cold-Climate Sculptors of Continents. Shorelines: Changing Landscapes Where Land Meets Sea. Wind: A Global Geologic Process. Global Warming: Real-time Change in the Earth System. MARKET: An interesting reference for anyone interested in learning more about Earth’s processes.